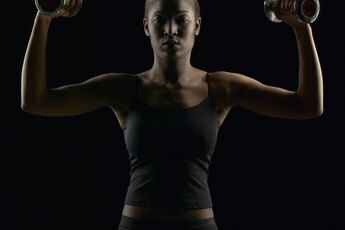 Does Using Heavy Dumbbells Burn More Calories Than Barbells? No matter which type of free weight you use, if you aren't challenging yourself, you won't get results. Strength-training burns a lot of calories, but it's a lot of work -- and you don't want to waste time and energy using the wrong equipment. With so many choices in the gym for working your muscles, it can be daunting to figure out which free-weight tool is best. Dumbbells and barbells are both great for building muscles, and muscle-building is a highly effective way to burn calories. Whether a dumbbell or a barbell works best depends on the exercise. Working with free weights burns calories by building muscle. When you challenge a muscle, you tear tiny muscle fibers, and then your body expends energy -- by breaking down fat -- to build back the muscle into stylish definition. 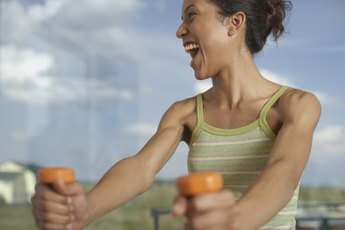 To burn more calories, you need to build bigger muscles. Progress to heavier weights to keep pushing your muscles far enough for them to tear on a microscopic level. Dumbbells and barbells both build muscles that burn calories, but each has its own advantages. When trying to decide between dumbbells and barbells, ask yourself which tool will push you further as well as which one better works the muscles you want to work. When it comes to which tool gives your muscles the biggest challenge, barbells win easily for most exercises. This is because barbells can hold a lot more weight than dumbbells. For serious bodybuilders, you will have a hard time increasing the challenge with dumbbells once you want to progress past 120 pounds. Barbells can handle hundreds of pounds. In a study conducted by the "Journal of Sports Science," participants used only barbells or dumbbells for chest presses. The barbell group got 17 percent stronger than the dumbbell group. More muscles means more calories burned. A barbell isn't the best tool for every job. Sometimes, a dumbbell can help you achieve your weight-loss goals better than a barbell. In the same "Journal of Sports Science" study, there was no appreciable difference between barbells and dumbbells when it came to targeting the biceps. And dumbbells edge out barbells with this muscle group, because dumbbells force you to use each arm equally. Working each side separately by using dumbbells ensures balanced results, so you can use dumbbells to build muscles that will burn big calories without getting lopsided. For those just starting out with free weights, dumbbells are the better choice because there is a smaller risk of injury. They are also easy to purchase and store in your own home if you don't like working out in a gym. The best workout is a well-rounded one, so embrace a routine that uses barbells for the chest and triceps and dumbbells for the biceps to maximize your results and calorie loss. Huffington Post: Still Believe 'A Calorie Is a Calorie'?